If you are curious what is happening behind the scenes at Fall Creek in Texas Hill Country, check in for our winemakers' and sommelier's notes on harvest, wine production, Texas wine and terroir. Juicy, sun-ripened strawberries. Delicate, floral white peach. Aromatic and flavorful yet dry, crisp, and refreshing. Yes, we are talking about the delectable flavors of our 2018 Vintner's Selection Creekside Rosé. It’s cheerful cherry hue and mouth-watering intensity of flavor will keep you coming back for another taste. Zesty and never overpowering, our Creekside Rosé is our wine of choice for Easter Dinner. Yes, its flavor is legendary, but its pairing versatility is practically unmatched. If you need one single wine to accompany a wide range of food options, our rosé is always the answer. It can provide the delicacy that a lighter dish craves, but its richer profile stands up to the substance of a heavier meal. 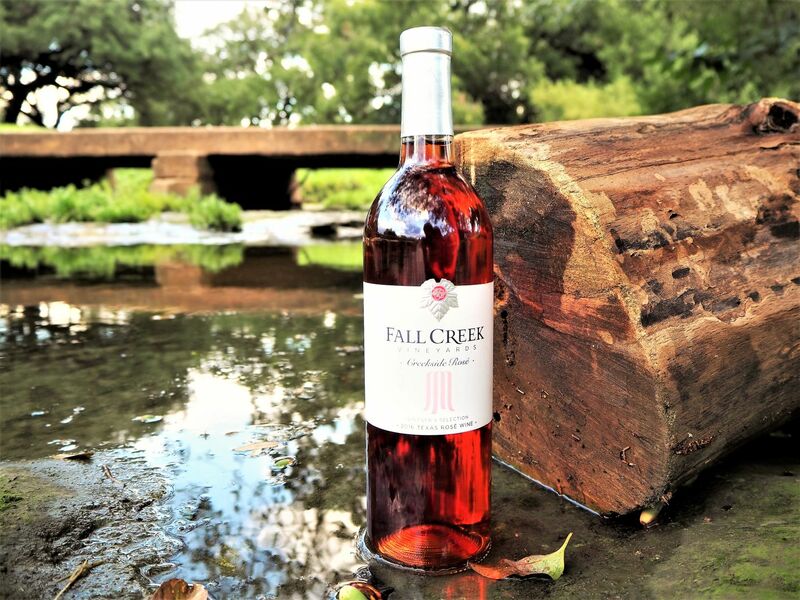 From salads to steaks, our Creekside Rosé is the perfect food-friendly pairing. We love our Creekside Rosé with roast pork. Try this delicious recipe for Pancetta-Wrapped Pork Roast for your Easter dinner. Blend the garlic, rosemary, thyme, and oil in a small food processor until the garlic is minced. Sprinkle the pork roast generously with salt and pepper. Arrange the pancetta slices on a work surface, overlapping slightly and forming a rectangle. Spread half of the garlic mixture over 1 side of the pork and between the 2 loins that meet in the center of the tied pork roast. Place the pork, garlic mixture side down, in the center of the pancetta rectangle. Spread the remaining garlic mixture over the remaining pork. Wrap with pancetta, overlapping strips slightly. Use toothpicks to secure pancetta, if necessary. Place the pork in a roasting pan. Cover and refrigerate at least 1 hour and up to 1 day. Pour 1/2 cup of broth and 1/2 cup of wine into the roasting pan. Add more broth and wine to the pan juices every 20 minutes. Roast the pork until a meat thermometer inserted into the center registers 145 degrees F for medium-rare, about 1 hour. Transfer the pork to a cutting board. Tent with aluminum foil and let stand for 10 minutes. Pour the pan drippings into a glass measuring cup and spoon off any fat that rises to the top. Using a large sharp carving knife, cut the pork into 1/4-inch-thick slices and serve with the pan juices. Spring is almost here. With the approach of spring, the grape vines are preparing to come out of dormancy with the onset of bud break. In preparation, the Fall Creek crew is hard at work pruning the vineyards. Winter pruning is an essential process that must occur annually in order to produce a good crop this season, as well next year. There are two big reasons that it is essential to prune the vines before spring growth: 1. to ensure the vines structure are trained to grow properly, and 2. to appropriately balance the crop growth with the leaf canopy growth. It is during the first few growing seasons that the structure of the vine is formed. After this is established, an annual maintenance of pruning off canes from the previous growing season is required to ensure that healthy fruiting canes develop this growing season; fruit will only grow on new shoots from one-year-old canes. To ensure a sound structure for the vine, a strong trunk must be created by training a healthy shoot upwards on the vertical wire/post until it reaches the bottom-most horizontal wire. The next season, the two strongest and best-positioned lateral shoots should be tied down to the horizontal wire to form the cordons, or arms, of the vine. The shoots that grow off the cordon are trained upward and held in place by more horizontal catch wires. This is the training method we employ at Fall Creek’s Oxbow Vineyard in Driftwood, which is called VSP, or Vertical Shoot Positioning. Once the vine is correctly trained, winter pruning transitions into a more maintenance-driven role. At Fall Creek in Driftwood, some of our younger Carignan vines are still being trained to their more established structures; however, the older Cabernet Sauvignon vines are one year more mature and ready to bear a high yielding fruit crop. Stay tuned to hear about bud break which we expect in the next few weeks as Spring blossoms. To celebrate the arrival of Spring, Fall Creek is partnering with two Texas Hill Country friends in a progressive dinner on March 28, 2019. The evening will start at Thurman’s Mansion overlooking Salt Lick Vineyards with the first three courses prepared by Scott Roberts and Salt Lick BBQ. We will then transition to Fall Creek Vineyards at Driftwood to enjoy the next four courses of Texas Hill Country Cuisine prepared by Chef Bryan Gillenwater of Bryans on 290. We will enjoy the bounty of the two vineyards as pairings to the delicious progressive meal. Join us to see the vineyards in their Spring glory and to celebrate the end of this rather chilly and wet winter! The menu and tickets are available on our Fall Creek Vineyards website. The sun is tempted to shine. The days are warming up. The bluebonnets are beginning to pop up along the roadside. Spring is on its way (a little bit early here at Fall Creek). With that, we are preparing for our vineyard to come back to life and start the long growing season ahead. We’d love to keep you abreast of what’s been going on in our vineyards throughout these chilly, drizzly months. You’ve probably noticed that, during the winter, there seems to be little activity in the vineyard; the vines look like little more than sticks protruding from the earth. Well, surprisingly, the winter stage of a grapevine’s life cycle is very important. To protect itself from the harsh cold, a vine must go into a state of dormancy, a stage where its growing ceases, its leaves fall, and it retreats into a woody state. Because the process of photosynthesis is halted, the vine must survive from the reserves stored during the previous growing season. It is very important for the vine to properly accumulate these carbohydrates to sustain itself during these winter months, not unlike a bear preparing for hibernation. During the cold winter months, the vines stay "asleep" until spring, when they reach the adequate number of warmer hours to initiate the next stage: bud break. Bud break is when the grape starts its annual growth cycle. It is when the tiny buds on the vine start to swell and eventually shoots begin to grow. The timing of bud break varies slightly from year to year and is dependent mostly upon climatic influences. 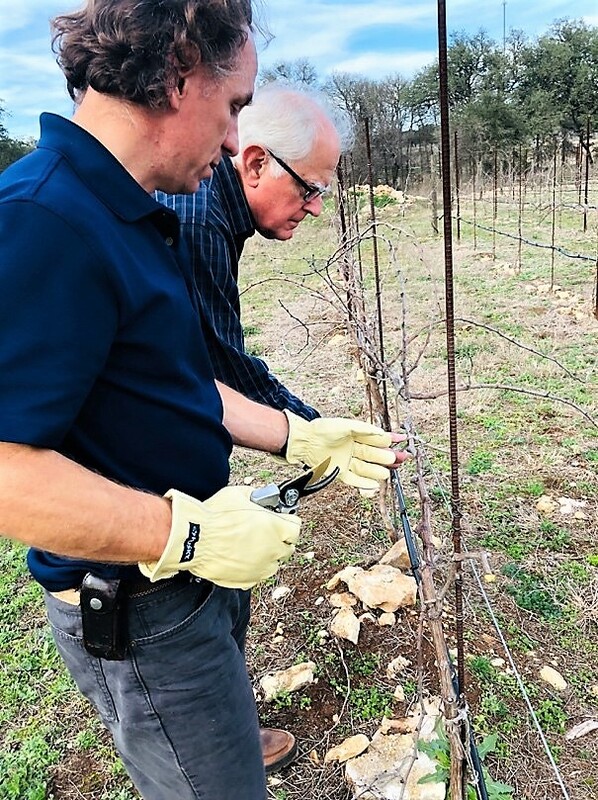 With spring and bud break fast approaching, we are hard at work here at Fall Creek Vineyards, pruning the vineyards in preparation for the great growing season this year. We hope that the 2019 vintage produces a crop of fine fruit that will translate into incredible wines, just as they have in previous years. We are still blown away by our 2016 vintage, a small but quality crop that produced superior grapes for our wines including the new ExTerra lineup. So, before bud break occurs, we are hosting one last winter event: a wine dinner! To honor the 91-point scores that our ExTerra Tempranillo, Mourvedre, and Syrah all received from James Suckling, we are holding an exclusive 5-course dinner for Founder Wine Club members on the 1st of March. This dinner will be presented by Chef Bryan Gillenwater of Bryan's on 290 and will be at our Driftwood location. For more details, click here: https://fcv.com/events. Not a member and would like to join? Click here: https://fcv.com/wine-club-benefits. Here are two recommendations for home and away that are sure to delight your Valentine. Why not extend the romance through the weekend? 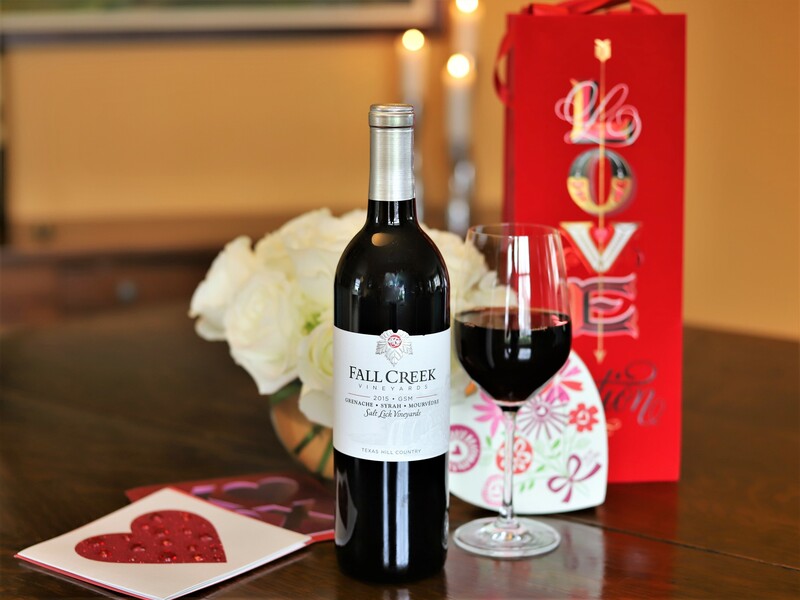 Our Valentine “Pique-nique dans les Vignobles” at Fall Creek Vineyards on beautiful Lake Buchanan in Tow, Texas, starting at 12 noon, on Saturday, February 16 is just the ticket. Enjoy a French inspired pique-nique basket with maple glazed, house smoked salmon, arugula salad, demi baguette with brie, blanched haricot verts and new potatoes, and tartelettes au limon curd. Select your favorite Fall Creek bottle to pair with this sumptuous lunch. In addition, after lunch you are invited to stroll the vineyards for a hands-on viticulture experience with winery owner, Ed Auler. New Year’s Jewels: Best wines ever from Texas? We received the loveliest of complements from Fernando de Luna of Vintages 2.0, San Antonio’s retailer of rare and fine wines, in our inbox this week. We were so honored and proud that we decided to share his kind words with you. Thank you, Fernando, for speaking so highly of our pride-and-joy, our newly released ExTerra wines. Having tasted Texas wines for the 40 years I’ve been in the wine trade, these new releases from Ed and Susan Auler’s EXTERRA are for me the finest, most characterful Texas red wines I have ever tasted. I know that is quite a statement as there are many other wonderful wines grown and made from Texas fruit. But these limited edition wines made in tiny quantities (44 to 134 cases per wine) grown in the Salt Creek Vineyard south west of Austin and carrying the Texas Hill County AVA, signal in the fullest sense of the word that these are wines of terroir… meaning that they reflect the vineyard’s character and the human skill and sensibility that went into the growing and making of wine from those grapes grown in that vineyard. It’s appropriate that Ed and Susan Auler have named these ExTerra, Latin for ‘From the Earth’. When Ed Auler came by the office/store last month to have me taste these wines I expected they would be very good examples though I also fully expected them to be made in what for me is the expected exaggerated New World style. By which I mean the wines would show the naturally clement conditions of a very warm climate and translate these into at best a one-dimensionally ripe, if not overripe fruit tricked out with the obvious makeup of too much expensive, heavily toasted new oak. Characteristics that are still too prevalent in most top-end Texas and New World red wines for this Old World trained palate. One sip of the ExTerra Syrah 2016 (only 44 cases made) and I was taken aback: here was a wine that, yes, had classic varietal notes of ripe plum, pepper, and violets but these combined in a balanced complexity of harmony and length with spice and a certain, for lack of a better word, minerality metaphorically speaking; here was a beautifully elegant wine that from its core expressed that undefinable yet unmistakable character of a good to great vineyard. I thought this was a wine that would do a southern French Rhône proud…and it was from a vineyard outside of Ausitn, Texas! Next was an equally superb expression of a 2016 ExTerra Mourvèdre (134 cases made): dark red fruit tones, dark spice and dark olive, full-bodied, supple, with mysterious depths of flavor. I could have been drinking a Bandol. To finish the range a superb 2016 ExTerra Tempranillo (72 cases made): luscious and lifted red strawberry and cherry fruit tones, a wine that shows Tempranillo has indeed found a good home in Texas. The subtle spice tone from the oak kept the wine from reminding me of a great, traditional Rioja Gran Reserva but it did remind me of one of the new wave Rioja that forgo long aging in American oak in order to emphasize the vineyard and its fruit. I can’t recommend highly enough that you try these wines if you want to experience an entirely whole new dimension to what Texas can achieve. The wines are very limited. We are incredibly excited to share that our three newly released ExTERRA wines have all received a score of 91 from renowned wine critic James Suckling in the tasting report, “American Wine Revolution”, a review excluding West Coast wineries. 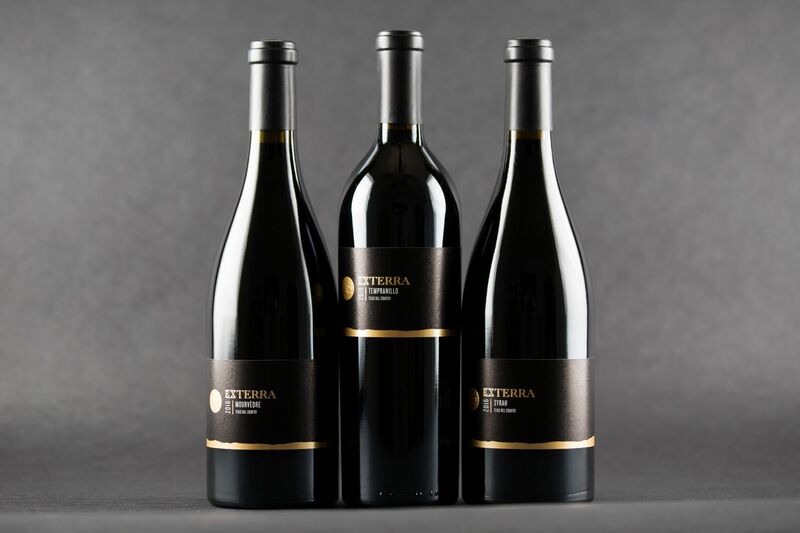 The new ExTERRA label was created as confirmation of the star quality of three single vineyard varieties deemed exceptional by the winemaking team. Fall Creek Vineyards wines were included in a tasting of more than 800 wines from some of the best wineries in 14 states that were evaluated by Suckling and contributing editors Nick Stock, William McIlhenny, and Stuart Pigott. In addition, Fall Creek Vineyards new ExTERRA Tempranillo, Salt Lick Vineyards, Texas Hill Country, 2016 received an “Outstanding American Wine,” evaluation from Suckling in an Instagram post. Winemaker Notes: The Mourvèdre is quite elegant this vintage with lively fruit character reminiscent of red and black plum, and ripe tannins supporting the terrestrial flavors of farmland soil, sarsaparilla and morel mushroom. Winemaker Notes: This Syrah has haunting aromatics that recall violets, smoked rosemary, bacon and black cherry. This is a lively wine with a ripe mid-palate and elegant tannins. The finish is savory and juicy with a hint of black peppercorn and Gaeta olive. Winemaker Notes: This is a full-bodied wine with a muscular structure, firm tannin and ample fruit. It expresses punchy aromatics that suggest a rain-drenched fire pit, dark roast coffee and roasted black plum. The finish is complex and lingering with hints of red currant and sweet tobacco smoke. We hope you will try these amazing wines and share your impressions with us. 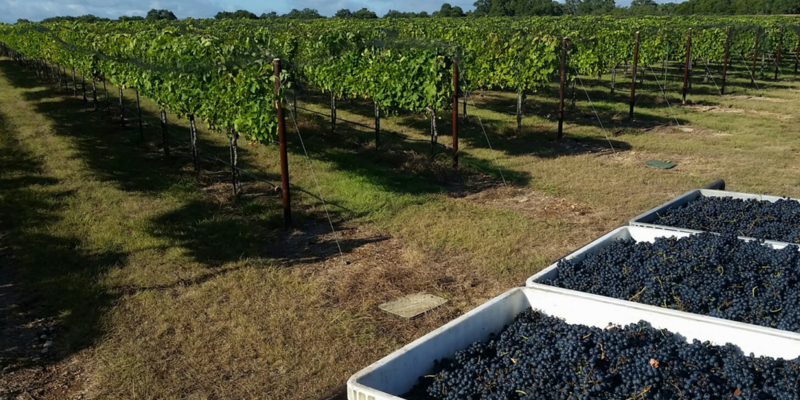 A quick look into the 2018 grape growing season in Texas Hill Country for Fall Creek Vineyards. The harvest will soon be upon us before we know it, because our red grape varieties are changing the color of their berries in the vineyard, which is called Veraison. This is a good time to review the weather thus far for the 2018 growing season. Coming out of winter, the vines started bud breaking at a normal time this year, which is mid to late March, and these dates are similar to the past several years with the exception of 2017 when it was about a month earlier. This year the vineyards had a rather cool April. In fact, Growing Degree Days (GDD) in the Dripping Springs area were just 440 which compares to 520 GDD in 2014, which is the next lowest of the last five years, compared to nearly 580 in 2015 and 2017, as seen in the chart below. Then, as if to play catch-up in a race, May brought enough heat to level the averages up, to the point of making 2018 the second warmest season over the same period. June set a solid record of heat accumulation, the highest in the current quinquennial. So, if these temperatures stay within reasonable ranges, we may expect harvest dates to be a bit earlier than those from 2014 to 2016. Just a reminder, 2017 had a full month advantage due to an unprecedented early budbreak, which moved harvest dates several days earlier than usual. Rainfall, on the other hand, has shown a 35% deficit compared to a normal year which has led us to compensate with the correspondent irrigation scheme. As stated above, we’re in the middle of veraison (pictures below) in the vineyards, which is officially the beginning of the ripening time of grapes. The weather, particularly precipitation, cannot be more crucial over the coming weeks. Whether we might have had a drought or a period of pouring rain up until today, it matters not, because the weather from veraison forward defines what the season is going to be like. This is the time for vines to “think” about their descendants. Yes, they need to “feel” like it´s more important to produce good seeds and prized fruit for the harvest and winemakers than to grow and expand their perimeter, in effect, foliage, which is exactly what they would do if they were to receive an endless supply of water, days on end. I know we need rain in the area, but for the record, hopefully, the downpours will not be coming our way until we have finished harvesting! Since the 2013 vintage, this is my 4th harvest as Director of Winemaking at FALL CREEK Vineyards, and now that we have the 2016 vintage in the winery, it is the proper time to look back over the past several months. While some fermentations are still lingering, our memories of the various stages of the season are very fresh. My harvest report will review the season in the context of the last three years in order to get a more in-depth perspective. During most of last spring and early summer, we constantly were consulting with the weather man to be aware and prepared for the changes in the weather. Watching vineyards get soaked by rain and lightning dance through the skies was all too familiar. Similar to the 2015 harvest, this year’s first part of the season was very wet. On the figure below, the rain events are shown in inches every day from Jan 1st to Aug 31st., during 2014 to 2015 seasons, as recorded in the Dripping Springs weather station which covers the Driftwood area, where we harvest grapes. It is clear that 2014 marked the ending of the long drought central Texas has experienced for the past seven years. Interestingly and fortunately, the last two wet seasons lasted only until June, and the period that followed was pretty dry, which coincides with the grape’s ripening phase. It is good to have a steady warm dry period for quality, as it will be explained below. The second part of August 2016, however, looks totally unusual, and it might have forecast not the best scenario for the grapes which were still hanging. Fortunately for us, the period that preceded that week long storm was dry, and the weather condition was good enough to allow us to wrap up harvesting all the grapes in the area. In fact, the rain started on the 14th of August, and we picked the last load of grapes on the 13th. In terms of total rainfall these last two years, we have had more rain than normal for the first eight months of the year as can be seen in the figure below where the cumulative monthly inches of rainfall up to August is reported. As I mentioned, in this last month of August alone, we had 12 inches of rain in the area, which left a big question mark for those grapes which had not yet been picked. It is good to point out, though, that there is no such thing as a normal year, since normal refers to an average of long term data. If there was such a thing as normal daily weather, the case would be such that it would rain a little bit every single day of the year, and we all know that’s impossible. Nevertheless, it is still a good indicator of the bulk volume of rainfall for a given region. So, what is the effect of these rains on grapevines? Well, there are stages during the season when plants need to grow and develop and times when they just need to concentrate their efforts on the clusters. Below is a scheme of the phonological stages of vines. (Adapted from Eichhorn and Lorenz (1977) and Lorenz (1994)). From stage 1 to 33 they need to expand their shoots and develop. After that which is marked by veraison (the change of color of the grapes), vines simply need to stop growing and divert photosynthesis production from new tissue to grapes. This simple change in behavior is one of the most important elements which predicts the quality that follows. The onset of such a phenomenon, also considered the onset of ripening, is very well aligned with temperature and the availability of water and nutrients. If the vines experience too much water and nutrients, then, the more difficult it is to accomplish a good ripening period. This is why it was very important to have that dry period starting just before veraison this and previous years. The plants had more than enough water to grow when it was needed the most and scarcity of water when it was not needed. In fact, it became so dry we had to irrigate the vineyards, in order for them to survive and do well, which is a standard summer practice. On the other hand, although we were not affected by them, the late August rains could have meant a delayed ripening and the threat of fungus diseases. So we can consider ourselves very lucky. As shown in previous posts, the table below shows the Growing Degree Days (GDD) accumulation zones as described by the two authors. The numbers indicate the summation of daily average temperatures minus 50ºF for a period of 7 months. I showed this scale the last two years, but I think it is good to refresh the context. This year, counting from April to August, there were 4,240.5 GDD accumulated in Dripping Springs, which is enough to fall into Zone V in the table. The fact that the scale includes a longer period (April to October) addresses the authors’ opinion about how correct GDD are in predicting plant growth. Because, at the end of the day, we see varieties being harvested at an equivalent heat accumulation index in the Texas Hill Country as compared to other cooler regions where this system was established. So, more important than the growing season length is the actual number of Growing Degree Days accumulated. All in all, this season was a mere 2.2% cooler and 1.9% warmer than last year and the long term average, respectively, (again, this is up to August). This is why most of the varieties kept their usual harvest dates within a reasonable range. Over the last three years we can see that give or take the seasons, we have been pretty much stable in terms of GDD, as it can be concluded from the two charts below, where at the end of August all seasons reach a very similar number. One down side of the season was a frost period we had before it all started. March 20th and 21st were just cold enough to affect early bud breaking varieties, like Tempranillo and others. Then, on March 25th we had another hit of low temperatures. These low temperatures may have varied in different sub-valleys within the Hill Country, but overall the temperature contributed to a low yielding year. Tempranillo, Salt Lick Vineyards – We are extremely excited about the 2016 Tempranillo from Salt Lick Vineyards. Like in 2015, this was the first red variety harvested this year. We harvested two separate blocks of the vineyard on August 4th and combined them in the winery due to small yields. Near-perfect ripeness was achieved at 25.1 brix and 4.11 pH. During the 19-day fermentation, special care was given to this highly tannic variety to encourage supple and delicate tannin extraction. The resulting full-bodied wine has complex flavors of mocha, chocolate, earthy spices, and dark fruits, and it has the potential to be our best version of this Spanish variety to-date. Syrah, Salt Lick Vineyards. Our second red variety to bring into the winery was the 2016 Syrah from Salt Lick Vineyards. This at times fickle variety came in impeccably ripened at 25.0 brix and 4.08 pH. The must was fermented in one of our stainless steel tanks, where it remained for 28 days. The combination of high quality and long maceration time resulted in a big wine loaded with crushed violet, jammy plum, and velvety tannin. The wine is intricate and balanced on its own, but it will also be an excellent component to our 2016 FALL CREEK Vineyards GSM blend. Sauvignon Blanc, Mesa Vineyards.- I would find it difficult to find another Sauvignon Blanc vineyard with 23 days on or above 100ºF under its belt during the growing season and yet be able to produce such a lovely wine. To add to the context described above, this vineyard was harvested right at 3,120 GDD, which was reached on July 26th, falling right in-between regions II and III on the Winkler scale. At print time this wine is kept cold over its fine lees, and we are sure it will make another astonishing wine this year. Chenin blanc, Mesa Vineyards. Just like the Sauvignon blanc, Chenin Blanc finds Pecos County its perfect home. Over the years it has shown great consistency. Chenin Blanc reaches such high quality that we decided this last season to introduce a 2nd vinification: FALL CREEK Vineyards dry Headwaters Chenin Blanc as a tribute to its potential. This year is no different. Lovely fruit character, lots of concentration and elegance. I can’t wait for you to taste this new vintage! Mourvedre, Salt Lick Vineyards. Another component of the future 2016 FALL CREEK Vineyards GSM, the 2016 Mourvedre from Salt Lick was the third red variety harvested. This is a Spanish grape, like the Tempranillo, that seems to tolerate the Texas heat remarkably well. The grapes were fully ripened at 26.3 brix and 4.03 pH. They were brought to Fall Creek on August 12th, just before the heavy August rains began. The wine has developed everything you would want from a Mourvedre throughout its 25 days in tank. Meat, earth, and subtle hints of guava and passion fruit are a few characteristics that mark this medium-bodied wine as a must-try from the 2016 vintage. Grenache, Salt Lick Vineyards. The Grenache from Salt Lick Vineyards was the last red variety that we harvested for the 2016 vintage (August 13th). Last year, we used this fruit to make an internationally awarded GOLD medal FALL CREEK Grenache Rosé, but this year we felt that it had enough color and fortitude to be made in a red wine style. The sugar accumulated to 24.2 brix, while the pH reached to 4.20 at harvest time. After 24 days in tank, the resulting wine is a light-medium bodied wine with notes of graham crackers, maraschino cherries, and strawberries. Look for this wine to make an appearance as the third variety in our 2016 GSM. Finally, as described, we just finished another tricky year. This 2016 season kept our hopes up for a higher crop yield, until the grapes were finally harvested and suddenly we realized shorter than usual days in the field. Anyway, Mother Nature takes and gives, I guess, and we need to be thankful of the good quality which in the end is what contributes to the prestige of FALL CREEK Vineyards Texas wines. PS. More about Growing Degree Days (GDD). 24ºF x 31 days in May = 774 GDD for that month. The same is done on the whole Apr-Oct period in order to get the total GDD of a particular area. It is assumed that below 50ºF plants stop growing metabolism, that’s why GDD is considered an accumulation of plants active heat and helps quickly describing an area in terms of temperature. It is not meant to be final as there are other more complex models that take a number of variables like latitude, humidity, winds and more, but it’s a simple and easy tool to use. Winkler, A.J., J.A. Cook, W.M. Kliewer, and L.A. Lider. 1974. General Viticulture. 4th ed. University of California Press, Berkeley. Each year is filled with important milestones and 2015 was not the exception. One of these recaps was the Cop21 or United Nations Conference on Climate Change held in Paris, not long after those infamous attacks at the French Capital. Countries gathered at the Parc des Expositions Paris le Bourget have pledged to stop the Earth’s temperature from increasing more than 2ºC (3.6ºF) and plan to achieve this goal by the end of the century (as their models suggest that earth’s temperature would reach this increase). Furthermore, they agreed to try to keep it below 1.5ºC (2.7ºF) to protect island states which are more exposed to the rise in sea level. All of the above is based on predictions of life threatening consequences in some areas of the globe they say would happen if the temperature were to rise above that of 2ºC from what it is today. Being a humble winemaker in Texas I cannot do much other than accept what 195 countries have adopted as the truth: the planet is getting warmer and if we do nothing about it, it is going to get worse. Since my plan (God willing) is to stay in the wine business over the next four decades it concerns me as to what the situation will be, say in 2050. Am I still going to have a job, should I consider a career change? So, I ask Mr. Google about “climate change” and I read a paper called “Climate change, wine, and conservation,” by Lee Hannah and eight other scientists, published by PNAS (Proceedings of the National Academy of Sciences of the United States of America) in 2013. I’m shocked right from the first paragraph of the abstract writing, because they have both optimistic and pessimistic scenarios for the coming decades that forecast substantial decreases of suitable area for viticulture from 19% to 73%! I stopped reading right there and went for a glass of our Fall Creek Vineyards Vintner’s Selection Cabernet Sauvignon/Sangiovese/Merlot blend, just to make this mind blowing fact more palatable. Then, they suggest that since the air is going to be so hot, sprinkling water over grapes will be necessary to cool grapes down to a reasonable temperature. As a result, this brings up new water conservation issues. Of course, I also, said, “WHAT?! For those of you not familiar with viticulture should know that any free water over grapes during the summer is literally a hotbed for fungus deceases. Digging a bit into the paper regarding the suggestion to cool grapes down, I find only one reference from an engineer that was measuring stream flow variations during hot days in the summer and cold days in the spring, but no explanation of the need to create a “cooling down system”. Apparently they confused a standard irrigation procedure (focused on the roots) during high atmospheric water demand periods with some novel cooling system, which, by the way, works fine for frost control during cold spring days. Maybe that is what confused them? After a few sips of wine I keep reading. They published striking maps showing soon-to-be-gone viticulture areas and new ones to come around the world. For example, Italy (and all red colored areas on the map) would no longer be able to produce wine and France would be completely redrawn…start thinking about something to replace those beautiful Brunellos! More wine! Further down the article I had to say, “Wait a minute”! On one hand they point out that the most prominent new wine region in the US would be the Northwest especially in the Rocky Mountains near the Canada/US border (shown in blue and light blue on the map). On the other hand, they say expansion of new vineyards in the area, including all its related developments (houses, roads, wineries, etc) might threaten protected habitats, of perhaps Yellowstone and Yukon. So here is the prediction: a climate change with the capacity to eliminate vineyards in vast areas, relocating them to new zones, is not strong enough to affect current ecosystems where large mammals and other species are protected. How could that possibly work? They even suggest timely land acquisitions to prevent the potential ecological threat that the wine industry represents. The article simply gets worse. These scientists claim that tropical mountain terrain have the potential to become relevant viticulture areas, threatening, again, those high biodiversity areas. 1. Grape growing started, at least, some 7,400 years ago in the desert regions of the Middle East where one of the most torrid summers on earth can be felt and yet vines where able to thrive there even before they were domesticated. Professor Patrick E. McGovern (www.penn.museum/sites/biomoleculararchaeology/) can tell you all about it. This is the reason why we can grow wine grapes successfully here in Texas. Grapes are fully adapted to the hot weather just like they were when they were first discovered by early civilizations, so I think there is also a need for cross checking, so they can really back up their conclusions. 2. The kind of environment which these writers are claiming to be impossible for viticulture in the future already exist on our planet, actually, within the very USA. It is like these people have a “window to the future” where grapes are thriving in places that today are as warm as the places which they are predicting are going to be in the future. In other words, they have the perfect “test site” right here, right now. Why not use these areas to check and eventually correct the models? If they don’t pay attention to this and Texas goes beyond 10,000 acres of vines these scientists are really going to have to come up with a good explanation about how their models are wrong. As I said at the beginning, I can’t contradict what has been agreed by all the countries on the planet but, honestly, if they are airing their concerns in publications like these I’m not so sure anymore.